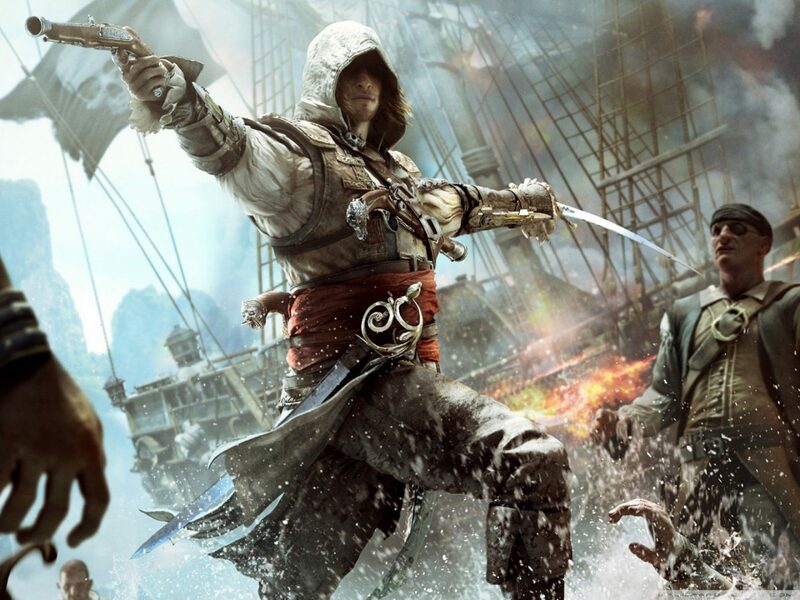 Assassin's Creed IV: Black Flag Review – AiPT! Winter is in full swing and many of us are rushing to warm places, away from snow and freezing winds. The rest of us stay home — dreaming of tropical islands, palm trees and blue oceans. And if you haven’t had a chance to travel there in real life, Ubisoft has you covered with Assassin’s Creed IV: Black Flag, which shows you 18th century Caribbean in all its glory with pirates, whaling, sailing and lots more — but should you book passage on the next schooner? In your first few minutes of playing, AC IV shows you how far the series has departed from previous games. You are Edward Kenway, a farmer turned privateer, who kills an Assassin in self-defense. This nets Edward the robes and weapons, along with a letter that points him to Havana. Then you have a 2-hour long introduction to the ever-present factions and their main goal: The Observatory, a device that allows people track any person anywhere on the globe. All that matters to Edward, however, is the fortune he can claim for himself when he finds this prize. No matter how clichéd the motivation, this is a welcome change. You are no longer tied in the Templars vs. Assassins conflict and instead are pursuing your own ends. The present day Animus nonsense is still going on, but it happens rarely and ends quickly enough for you to not be bothered. The story, however, still unfolds mostly through cutscenes and dialog overheard during the tailing missions, which comprise about 70% of the campaign. They’re linear, restrictive and are ultimately the worst part of the game. Not even great writing and interesting twists can save it, when you also take into account the numerous artificial prolongations (antagonist plot armor, yay). All these slowdowns make the experience clock in at 20 hours, with various tutorials taking the first third of the game, artificial decompression the second and hasty wrap-up the third. The greatest elements are the characters Edward meets — including Blackbeard, Anne Bonny, Calico Jack and Benjamin Hornigold. What really saves AC IV is its side activities. The first obvious highlight is sailing. It’s no simulation, so wind direction doesn’t play any part and your ship is very easy to handle. However, this easiness helps you both in battles and navigation. You can use your ship to capture forts and claim territory, cripple and board other vessels to loot their cargo and take their crew, get into your rowboat to harpoon whales and sharks, or use a diving bell to search shipwrecks for treasure. It’s all at your fingertips, regardless of whether you use a controller or keyboard/mouse combo. It’s also precise, fun and immersive. And if you get bored while sailing to a destination, you can always have your crew sing for you. One sore spot if that upgrading your ship is mandatory. You won’t be able to finish the game or take on though enemies unless you get better armor and stronger guns. Those with little patience can buy their way around this with special DLC, but the rest will be locked into some grinding. The same is true of land-based gameplay. You have assassination contracts, warehouse raiding and delivery jobs, along with a few other things you’re likely to get bored of pretty quick. Add around half-dozen types of collectibles scattered across 3 main cities (Havana, Nassau and Kingston) and numerous islands and the playtime is potentially limitless, but pretty boring. And unless you craft yourself some upgrades, you also won’t get to the end of it. Crafting requires hunting and skinning animals similar to FarCry 3, but if you’re an animal lover, you can buy hunting goods, but the money and resources you earn can be blown through pretty quickly with all the ship and character upgrades. Couple that with numerous harbors you can develop and the game already feels like a chore, no matter the awesome individual parts. But wait, there’s more (thanks, Billy). Deluxe edition owners also get the Aveline DLC. It’s a 2-hour-long 3-mission side story about the protagonist of AC: Liberation (already out on PS Vita, coming soon to PC and consoles). It’s a nice slice and doesn’t differ much in gameplay from the main game. But it’s still just a bonus and a pretty linear one, that doesn’t justify the extra money. Finally, AC IV also has multiplayer. It has the same progression and customization system, along with all the stealthy DM, TDM, CTF and Conquest variations series vets know. The twist is the same – you have to identify your target before killing it and if you make a mistake and kill a civilian, your score decreases. Wolfpack co-op mode is also back, this time with a story-based tutorial mode called Discovery. There are also new maps and some minor updates, but on the whole, the MP is a small distraction that won’t keep you playing for months. At least its netcode works and the controls are solid. You can’t switch controllers on the fly, though, so be warned. More issues appear in gameplay. While free running, naval combat and exploration are great and rarely suffer from any bugs, the land combat is a lot more difficult than in AC III and the simplified control scheme doesn’t help. Dozens of times has yours truly found Edward picking up enemy weapons instead of countering blows, just one of which could drop him do half health. Trying to break enemy defense can send you running nowhere and disarming is as pointless as before. Add brutes with grenades, tackling enemies that keep you from running, snipers and reinforcements that enemies call with bells and you get tons of annoying enemies that either slow you down considerably, or make you restart altogether. Uplay’s saves synchronization bug is also present, so make sure you have backups or risk losing 20 hours or more of game progress. To sweeten the pill, AC IV’s presentation is its best part. If your rig matches the specs listed below this review, you can safely max out the settings and take in the beautiful seascapes, crowded cities, alive with all sorts of things to be seen and conversations to be heard and remote islands where animals run free and time seems to not matter. It’s just as great underwater with sharks, foliage and lighting making you want to hold your breath and feel the water around you. Textures are crisp, reflections are realistic and there’s no lens flare. Oh, and there’s also the beautiful jungle. The voice acting is just as great, but be prepared to turn on subtitles if you have trouble with Welsh or Scottish accents. So in the end, Assassin’s Creed IV: Black Flag is a beautiful set of entertaining side quests with a dragged-out linear story, wrapped into some bonus content you won’t care about and a multiplayer nobody will play in a month. Should you buy the game? Probably wait for a sale. Should you play it? Definitely. Because when you set sail unto dawn, with your crew singing songs and whales jumping out of water next to you, just as you reflect on your latest adventure and plan a new one, you can almost forget about the game’s numerous issues and the winter outside and just take in the moment. And that’s what AC IV is great at, for it has a lot of them. If all you have to buy your way into summer this year is 60 bucks, take this. You’re very unlikely to regret it. What is World of Corecraft?